Comet West, Crater Lake by James Hervat - Two beautiful natural wonders meet at dawn. 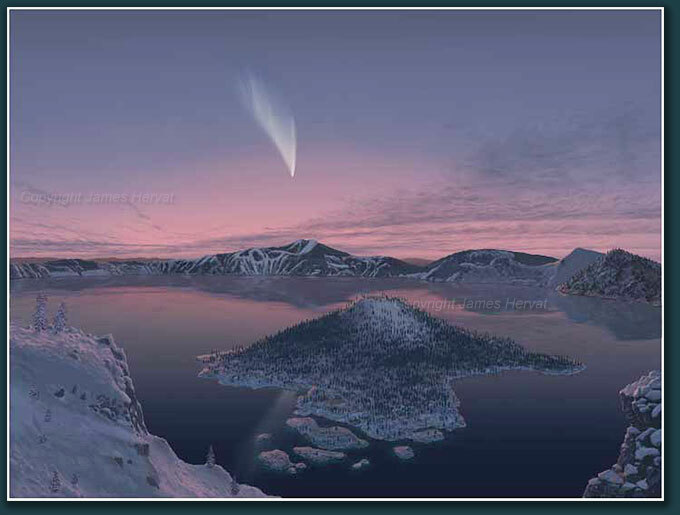 Comet West, Crater Lake (2009) - Comet West, which graced the Northern Hemisphere's pre-dawn sky in March of 1976, will be remembered as one of the most spectacular comets of the twentieth century--and also one that suffered from poor public relations. Only two years earlier Comet Kohoutek, although putting on a fine naked-eye display, fell short of predictions that it could be the "comet of the century". Thus reminded of the vagaries associated with predicting the appearance of inbound comets, astronomers were wary of similarly hyping Comet West as they watched it approach perihelion. The ensuing sparse media coverage unfortunately resulted in much of the public missing this stunning apparition in the early morning sky.